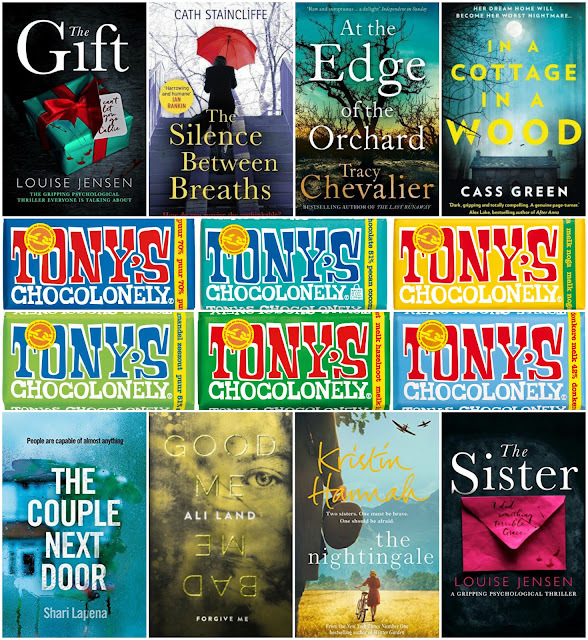 Enter this giveaway for a chance to win eight gripping books and six chocolate bars. Good luck! They really hold your attention and keep you guessing about the events in the pages to come. I love suspenseful, on the edge of your seat writing. Part of it is the feeling of how each of us react differently to circumstances and wondering how I'd manage in the character's shoes. I also love intricacy, be it in the research behind the words or the solving of a crime. I love how they have me turning pages long after I should have gone to sleep! It's identifying with the charcter's and worrying about them. The suspense of turning each page. And keeping me reading way past bedtime. I love a gripping stories ability to provide you with complete escapism from reality. To transport you somewhere else and make you unconcerned with any stresses you may have at the time. "What do you like the most about gripping stories and why?" I like having heroic characters pursuing justice and making me wonder what comes next! I like how I get sucked into them. It's fun to escape into another world for a while. The excitement and expectation of what may happen next - on the next page! Good descriptive writing enables you to visualise what is happening, as if you are watching a film in your head. The unexpected turn of events, dramatic changes in a character, flow of events and so much more. It all leads to amazing stories to be made. The way they draw you in, keep you glued. I love the suspense of it. I always enjoy a book which keeps me gripped to the end, and I love sharing this type of books with family and friends. I love that they keep me in suspense as i can't put the book down and have to keep reading. I love the suspense that keeps my bloodpressure up while savely in the knowledge that nothing can harm me (while I hide beneath the covers with a flashlight, haha). gripping stories always keep me guessing! Gripping stories are full of excitement and suspense, I can't put this sort of book down I have to know what happens next. I like to solve a mystery along with the characters, and not have it obvious halfway through the book. I love books that hold my interest and I can't wait to pick them up again. I love the twists and turns, the way your opinion changes about characters - and not wanting to put the book down! I like not knowing what is around the corner! The suspense that holds you and keeps you turning the pages. I love when stories have me on the edge of my seat and are unpredictable. They keep you up after bedtime because you can't seem to put them down!! I love following the twists and turns that end up in the big reveal. I like that they take me out of my usual world for a little while. I like to buy a book and read it in one afternoon. I love beaing surprised in a story and I love it when my brain has to work. What I like about gripping stories is that you can get transported and lost in another world it's like taking a really good holiday! The fact that they keep you guessing. I like being so deep into the book that I can't put it down, and when I finally do I have to remember what world I'm in now. I love never knowing what's coming next, and that satisfying feeling when the end is not at all what you expected but was oh-so-clever! I love how they totally engross me. What I like most about gripping stories is how they keep me wanting to know what happens next. Good ones have me up all night. When a story really grips me I love how I can forget everything else around me. I'm a total worrier, so a good gripping book gives my mind a real break. I love the suspense and often cannot put them down! What do you like the most about gripping stories and why? I love the excitement. I love being sucked in and sitting at the edge of my seat. They keep you guessing until the end and sometimes you feel like rooting for the "victim" and on occasion sympathising with the "villain" (depending on the crime). It makes you question what would you do in their shoes and you spend a lot of time wondering what's going to happen next. What i like about gripping stories is that they can make me feel the gripping otherwise i don't dare it in real life.